RoboCup 2018 took place in Montreal, Canada. UT Austin Villa won first place in the 3D Simulation League and finished in the top 8 in the SPL. The RoboCup IranOpen 2018 took place April 5-7 in Tehran, Iran. UT Austin Villa won first place in the 3D Simulation League. RoboCup 2017 took place in Nagoya, Japan. UT Austin Villa won first place in the 3D Simulation League and finished fourth in the SPL. The RoboCup IranOpen 2017 took place April 5-7 in Tehran, Iran. UT Austin Villa won first place in the 3D Simulation League. RoboCup 2016 took place in Leipzig, Germany. UT Austin Villa won first place in the 3D Simulation League and finished second in the SPL. The RoboCup US Open 2016 took place April 22-24 at Bowdoin College in Brunswick, Maine. UT Austin Villa won first place in the SPL. The RoboCup IranOpen 2016 took place April 6-8 in Tehran, Iran. UT Austin Villa won first place in the 3D Simulation League. RoboCup 2015 took place in Hefei, China. UT Austin Villa won first place in the 3D Simulation League and finished in the top 8 in the SPL. The RoboCup US Open 2015 took place May 1-2 at Bowdoin College in Brunswick, Maine. The RoboCup IranOpen 2015 took place April 8-10 in Tehran, Iran. UT Austin Villa won first place in the 3D Simulation League. RoboCup 2014 took place in Joao Pessoa, Brazil. UT Austin Villa won first place in the 3D Simulation League. The RoboCup US Open 2014 took place May 2-4 at Bowdoin College in Brunswick, Maine. The RoboCup IranOpen 2014 took place April 9-11 in Tehran, Iran. UT Austin Villa won first place in the 3D Simulation League. 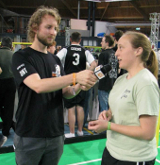 RoboCup 2013 took place in Eindhoven, The Netherlands. UT Austin Villa won second place in the 3D Simulation League and third place in the SPL. The RoboCup IranOpen 2013 took place April 5-7 in Tehran, Iran. UT Austin Villa won first place in the 3D Simulation League. RoboCup 2012 took place in Mexico City, Mexico. UT Austin Villa won first place in both the SPL and the 3D Simulation League! The RoboCup US Open 2012 took place from April 20-22 at Bowdoin College in Brunswick, Maine. TT-UT Austin Villa won first place. The RoboCup IranOpen 2012 took place April 3-7 in Tehran, Iran. UT Austin Villa won first place in the 3D Simulation League. RoboCup 2011 took place in Istanbul, Turkey. TT-UT Austin Villa finished in the top 8 in the SPL, losing only to the two finalists. The simulation team won the 3D Simulation competition. RoboCup 2010 took place in Singapore. TT-UT Austin Villa finished in 3rd place, losing only to the eventual champions in the semi-final game. We also came in 2nd in the Technical Challenge, losing 1st place by only 1 point. The RoboCup US Open 2010 took place from April 16-18 at Bowdoin College in Brunswick, Maine. TT-UT Austin Villa won first place! RoboCup 2009 took place in Graz, Austria. TT-UT Austin Villa finished in fourth place, losing to only two teams. The RoboCup US Open 2009 took place from May 1-3 at Bowdoin College in Brunswick, Maine. TT-UT Austin Villa won first place! US Open 2008 took place from 24 to 27 May 2008 at the Carnegie Science Center in Pittsburgh, Pennsylvania. The Ut Austin Villa team took 2nd place, losing by one goal in the finals. RoboCup 2007 took place from 1 to 10 July 2007 at the Georgia Institute of Technology in Atlanta, Georgia. The UT Austin Villa team took 2nd place out of 11 entrants in the RoboCup@Homes competition. Also, the legged league team made the quarterfinals. RoboCup 2006 took place from 14 to 20 June 2006 in Bremen, Germany. US Open 2006 took place from 20 to 24 April 2006 at the Georgia Institute of Technology in Atlanta, Georgia. RoboCup 2005 took place from 13 to 19 July 2005 at Intex Osaka in Osaka, Japan. The UT Austin Villa simulation team won 1st place out of 10 entrants in the simulated coach competition. Also, the legged league team made the quarterfinals. US Open 2005 took place from 7 to 10 May 2005 at the Georgia Institute of Technology in Atlanta, Georgia. UT Austin Villa placed third in the legged league competition. RoboCup 2004 took place from 27 June to 5 July 2004 at the Lisbon Industry Fair in Lisbon, Portugal. UT Austin Villa made the quarterfinals in the legged league, and made it to the second round in the simulation coach league. US Open 2004 (renamed from "American Open") took place from 24 to 27 April 2004 at the University of New Orleans in New Orleans, LA. The legged team placed third, while the simulation team placed fourth in the soccer competition, and second in the coach competition. Robocup 2003 took place from 5 to 11 July 2003 at Padova Fiere in Padua, Italy. The legged team was placed in a very hard group and did not win any official games. We did win several practice games and were satisfied that we are well on the way to having a competitive team. Some aspects of our approach were validated nicely as we achieved the fourth best result (unofficially) in the scientific challenge events, which do not require a fully polished team, but test the robustness of the team's algorithms. The simulation team placed first in the coach competition, besting 10 other teams. The first RoboCup American Open took place from 30 April to 4 May 2003 at Carnegie Mellon University in Pittsburgh, PA. Despite playing against opponents that had been working in the domain for at least a year and in some cases much longer, the legged team did respectably, scoring a goal, earning one point, and only losing to the eventual runner-up by a score of 2-0. The simulation team placed second in the coach competition.